This funeral home is the oldest business in Port Hope, and certainly one of the earliest surviving establishments in Canada, if not North America, to be situated in its original buildings. In fact, this firm has been providing services to the people of Port Hope and surrounding area since before the confederation of our country. In 1884, J. T. George became a charter member of the “Undertakers Association of the Province of Ontario”, now the Ontario Funeral Service Association. His original membership card is believed to be the only one in existence. It was displayed at the convention celebrating the 100th anniversary of the Ontario Funeral Service Association. The lot was originally granted to Jonathan Walton and Elias Smith from King George III on August 26, 1797. In 1815, Elias Smith sold his rights to Jonathan Walton and on April 3, 1817 Walton sold to Thomas Ward. The land descended to various owners until it passed into the hands of the founder of the firm, James Trevethan George. The funeral business in Port Hope is steeped in the local history of the town. 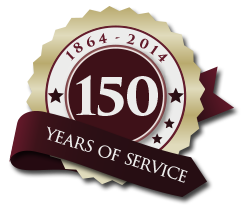 This firm retains records from the year 1864, the year of establishment. The Port Hope Evening Guide has on record that a Mr. Furby came to Canada from England and settled in Kingston. 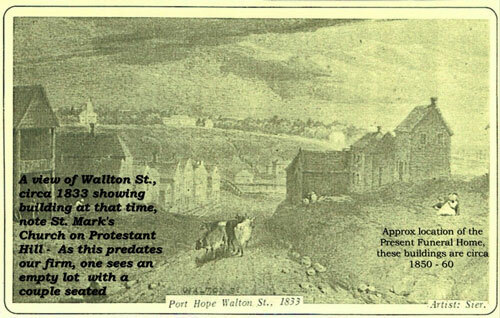 In 1826 he moved to Port Hope and operated a furniture business in a “building east of the original Guide office”. It is difficult to determine if Mr. Furby operated from the present location. Some indication of this can be found in a family diary in the possession of the family of the late Mr. Edwin Wilson of Garden Hill. His ancestors made an entry in the 1850’s of traveling to Port Hope to purchase a coffin for a deceased family member, from Mr. Furby on Walton Street. It is possible that this was the location of that business. Mr. Furby, it seems, was on a leased contract and therefore his name does not appear in the registry office, as was the situation with James Trevethan George, until the purchase of this property from the widow of William LeLean in 1892. The George family conducted business for three generations at this Walton Street location. The founder, James Trevethan George Sr. came to Canada West in 1864. The building originally known as “LeLean’s Building” was a modern structure, handsome and typical of mid 19th century architecture. One can to this day notice the pride taken in creating the delightful, ornate brick design across the top of the facade, with other proud features such as the Tudor Rose and Scottish Thistles, cast into the iron gables over the four upper windows. The lower facade however, was quite different than that of present times. Early photographs reveal two distinct entrances, the upper to the furniture store and the lower entrance to the undertaking office. The separation of the two distinct businesses was quite common. Every undertaking firm had a furniture business. 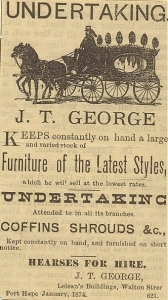 In 1905 the furniture store was discontinued, allowing this firm to exclusively offer funeral services to the municipality and surrounding area. This was virtually unheard of elsewhere and marked the beginning of the funeral home as a sole entity, as we now know it. In the 1920’s with the advent of the automobile, the grueling horse-related chores became a thing of the past. 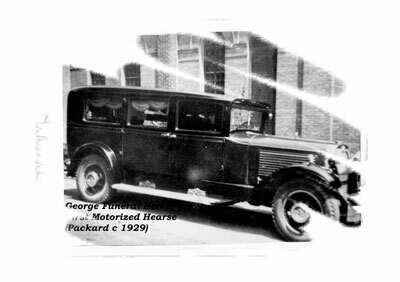 At this time an ambulance service with a special vehicle was established, functioning 24 hours a day. Along with the ambulance, a loan cupboard was maintained where hospital beds, wheel chairs and folding chairs were available to the community. Another important change began to develop at this time as the funeral service location shifted from the residence or church to the funeral home. This trend gained favour and by the 1930’s it became popular for most wakes and funerals to be held at the chapel. Extensive renovations were completed to accommodate these new needs. Whereas, in previous years, embalming was conducted in the home, the new trends brought on the need for a preparation room and special separate rooms for visitation. During these years the George family also controlled and maintained a non-profit organization, “The Port Hope Union Cemetery. ” In the early 1950’s Bev George, who held the controlling block of this company, donated the cemetery to the Town of Port Hope. maintained it until their retirement in 1990. On June 4, 1974 Craig Ross obtained his Funeral Director’s License upon completing his apprenticeship at McIntosh Anderson Funeral Home in Oshawa. In September of that year he joined his parents in the business. In June of 1977, he married Mary Ann Elizabeth Jamieson, who then joined the firm. On August 1, 2000 their son Jamieson McKellar Ross obtained his Funeral Director’s License and on September 11, 2008 another son Adam Cosgrove Ross obtained his license.